Seattle choreographer Christy Fisher partners with Sharon Mansur (Washington D.C.) with Cocoon, a dance-installation with video by Caterina De Re, music by Garrett Fisher, flute by Esther Sugai, and costumes by Deb Shannon. This project is the beginning of a larger cross-country collaboration that incorporates the internet as a platform for movement-based dialogue. 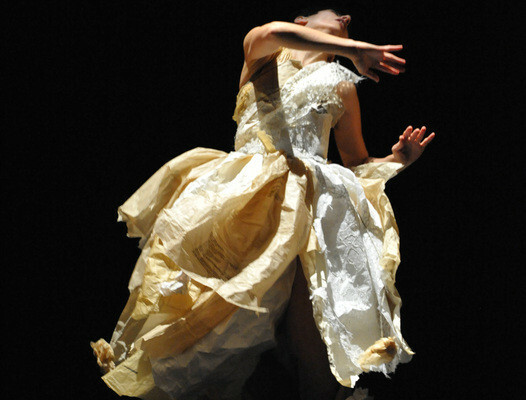 Each choreographer will inhabit a dress based around the 19th century “bustle”, which extends into an eight-foot “cocoon” that also serves as a video projection screen. Through sound, visual imagery, and the metaphor of the bustle/cocoon, we explore the emotional content of social and personal memory. Each artistic collaborator serves as both witness and catalyst as memories ignite, crystallize and then dissolve back into a common dream. Seattle composer Kenneth Lawrence and Soju Projekt present Shikhandi/Amba, a Noh- and gamelan-inspired dance-drama with a plot abstracted from one of the central stories of the great Indian epic Mahabharata. In the story, a young woman, Amba, is kidnapped on her bride-choice day. Incapable of avenging her humiliation, she throws herself into the flames of a sacrificial fire in order to be reincarnated as a man and confront her kidnapper. The instrumentation provides the essence of the two traditional forms that inspired it, Noh drama and the Wayang Kulit shadow puppet theatre of Bali and Java. The ensemble is comprised of Western and Eastern instruments, including western flute, gamelan (tuned percussion), Indian harmonium, Himalayan healing bowls, toy piano and Japanese taiko drums. Presented by the Fisher Ensemble.